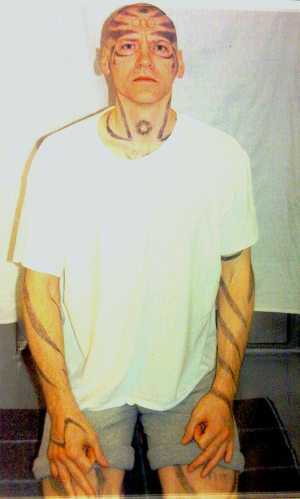 Jack Powers, who spent more than a decade in extreme isolation in ADX. Self-mutilation is common among individuals held in long-term solitary confinement. This essay by John Jay Powers was published by theColorado Independent, with the following introductory note by editor Susan Greene. Greene has corresponded with Powers for years, and included him in her multimedia investigation of solitary confinement, The Gray Box. After 12 long, hard years at the ADX Control Unit Supermax Prison in Florence, Colorado, I’m finally out and among the living. Oh, I’m not on the streets. I’m here among the general population of a federal penitentiary in the dry and dusty desert of Tucson, Arizona. For a guy who has lived alone in a cement box for more than a decade, the transfer here was really something. First there was a bus and then air-service called “Con-Air” – big passenger jets flown around the U.S. by the Marshalls Service. I had the opportunity to speak with other prisoners and see a couple of cities both from land and air. It was a trip for me for sure. When we pulled up at the pen, I was all prepared to go straight to the segregation where, once again, I’d be put into solitary confinement. Instead, a number of prison officials met me inside the door and told me that I’d be going directly into the population – into the best unit, in fact, where I’d have single cell. I was so shocked by this turn-around that I began to shed tears. After being alone in a tiny space for so many years, I had adjusted to a kind of self-sufficiency. My eyes had adjusted to seeing things only up close. To be trusted to be around other people without handcuffs, leg irons and belly chains was incredible. I kept waiting for someone to tell me to place my hands behind my back and turn around. But nobody did. Suddenly, I was a regular prisoner in a regular prison. To most people I figure may be reading this, I realize it may not sound like great fortune. But to me, it’s big luck to be back among the living. Still, now free to walk and talk among other prisoners, I’m starting to notice the effects that solitary confinement had on me. The noise and movement all around me is disconcerting. My conversational skills aren’t that good (as if they ever were) and I’m talking too slowly and pausing too often to gather my thoughts. If someone came up behind me, I’d jerk around to assess whether he meant harm. If somebody clasped my shoulder, I might whirl around and strike him because I’m not used to being touched, especially in a friendly way. And there’s another thing. Because I have tattoos on my face and head that make me look like an avator/avatar, I get a lot of looks. My appearance makes other prisoners wary of me. They ask where I had come from – what joint. And when I tell them, they shake their heads knowingly. They understand that I’ve been damaged. The years I spent at ADX have taken their toll in ways I couldn’t have expected. Like the first night here in Tucson when I tried to play basketball in the rec yard. I could dribble all around. But when I tried to take a shot the ball felt like a brick. Actually, a cinder block. The years I spent playing in my cell with a sock as my ball and a paper rim taped by my wall had destroyed my actual skills. Same thing when I tried to play the guitar. I amputated my fingers while at ADX. They can no longer work strings to make music. And I have no confidence that I’ll ever play again. What I can still do is write. And so I put these words onto paper, hoping that the experience of coming out of long-term solitary is something even people who’ve never spent even a day behind bars could find interesting. Everything seems surreal. It’s like I am dissociated, floating around in a fog, observing this new world from an emotional and psychological distance. In the chow hall, everyone sits in sections according to race and affiliations. It is segregated by the prisoners themselves. But I can go to any table and sit down and no one objects because they understand that I am no one and everyone at the same time. They know by the way I look and by the way I carry myself and by what they have already heard about me. They realize I carry some burden that was born from pain. Some of them offer me extra food, even by silently placing it next to my tray. One man offered two sugar cookies that I concealed in my sock. I got back to the unit unscathed by a shakedown, went into my cell, closed the door and ate them in the dark. For the most part, the unit I’m housed in is quiet. But whenever the inevitable idiot begins to holler, I get instantly stressed out. After so many years of silence, I long for the quietude. There is something inherently annoying about loud noise that everyone except the noise-maker knows about. As strange as it may sound, I’ve been tempted to pack up my meager belongings and head back to solitary. I feel like mutilating myself again. I feel like committing suicide. But I don’t feel like screaming because that is the worst. To give credit where credit is due, the lawsuit that was filed by Ed Aro of Arnold & Porter in Denver was the reason for my release from the ADX-Supermax. If not for them and for the Assistant U.S. Attorney Amy Padden in Denver and the editor of The Colorado Independent, Susan Greene, I would still be in a deep, dark hole and likely would not be alive right now. I think they know that a lot of bad stuff happened, and I think they are doing their best to fix it. All in all, I do not know where I’ll go from here. I will continue my mission to promote “The Manual,” a guide to getting by that I wrote at ADX. I’ll try my best to adjust to this new life with the fewest setbacks possible. And, if anyone wants me to, I’ll write about my experiences again for The Independent. Perhaps the writing itself – and the readership – is my catharsis. I want to be accepted. I want to be normal. I want to be the best human being I can be. But it may just be that I’m forever outside and beyond those possibilities. The intent of injury to my heart and mind is unclear as of yet, and right now I’m somewhat confused. After wearing pants without pockets for a long, long time, even having pockets is weird. I was just now standing by the door with my hands in my pockets and a guard came by and told me to take my hands out of my pockets. I complied, but then involuntarily went back to doing it – as if each hand needs the tight darkness. It makes sense to me. So much sense that I wonder whether I’ll be sent back to solitary for nothing more than sauntering around with my hands in my pockets. Thomas Silverstein has been called “the most dangerous prisoner in America,” based on several prison murders that took place 30 years ago. He has also been called “America’s most isolated man,” based on the conditions in which he has lived during those 30 years–conditions which, Silverstein and his lawyers contend, clearly constitute cruel and unusual punishment. Silverstein’s closely watched lawsuit, a groundbreaking Constitutional challenge to solitary confinement, had another day in court yesterday as attorney Laura Rovner argued his case before a federal appeals court. A detailed story on the appeal and its significance appeared in the Colorado Independent, written by longtime solitary watcher(and now Independent editor) Susan Greene. By law, you get 15 minutes to argue in the U.S. Tenth Circuit Court of Appeals. The rules are the rules. Yet that rule comes across as painfully ironic in the case of a man who has spent a million times that limit — 15,778,470 minutes and counting – in prison isolation. Tommy Silverstein, 61, has lived in solitary confinement nearly half his life, and longer than any other prisoner held by the federal government. Silverstein is no choir boy. He robbed a bank as a young man. He was later convicted of killing two men in prison. And he led the Aryan Brotherhood, a national prison gang, through the early 1980s. In 1983, he fatally stabbed officer Merle Clutts at the U.S. Penitentiary in Marion, Illinois. That killing coincided with another murder of a guard by a prisoner that same day at Marion, which had replaced Alcatraz as the federal government’s highest security prison. Those murders punctuated a rash of prison violence that decade and led to a national movement to build supermax prisons made up exclusively of solitary confinement cells for prisoners who, like Silverstein, were deemed to be the “worst of the worst.” The U.S. Bureau of Prisons built its supermax, the United States Penitentiary, Administrative Maximum Facility – commonly referred to as ADX – in Florence, Colorado. Known as the crown jewel of the federal system, ADX is considered the most secure prison on the planet. No one has ever escaped. Greene details the conditions in which Silverstein has lived for the last three decades in a series of supermax prisons. Those conditions were described by Silverstein himself in a lengthy brief, whichwe reported on here. Then Greene describes the issues at hand in the federal appeal. Two top national prison experts said the conditions Silverstein has endured are the most severe they’ve ever encountered. “Not only has he been subjected to the most extreme forms of isolation I have ever seen — placed in housing units that were literally designed to isolate him as completely as possible from other human beings — but he also has been confined in these places for an extraordinary length of time,” wrote Dr. Craig Haney, a psychology professor at the University of California, Santa Cruz, who has studied solitary confinement for 30 years. Laura Rovner, director of the student law clinic at the University of Denver, is Silverstein’s longtime lawyer who has worked with several crews of law students representing him. On Tuesday, she’ll challenge a 2011 U.S. District Court decision that upheld the Bureau of Prison’s assertions that Silverstein’s decades in solitary haven’t deprived him of life’s basic necessities. Judge Philip Brimmer sided with the BOP’s lawyers from U.S. Attorney John Walsh’s office that the case shouldn’t go to trial. Walsh’s office refused comment on the case. • The Bureau’s claim that 30 years in isolation haven’t harmed Silverstein. Experts who have evaluated him have found extensive evidence of depression, cognitive impairment, memory loss, hallucinations, severe anxiety disorder, panic attacks that make his him breathless and shaky in the company of others, and paranoia that leads him to hear voices whispering to him through vents. • The Bureau’s assertion that Silverstein is too dangerous to lessen the extreme solitary confinement conditions in which he is housed. Silverstein’s lawyers challenge this argument based on the two best predictors of a prisoner’s future dangerousness. One is age. At 61, Silverstein has statistically aged out as posing a risk of violence. Another predictor is recent behavior. His prison record has been clean for more than two decades. Rovner will argue that Silverstein should have his day in court to determine whether 30 years in extreme isolation amounts to cruel and unusual punishment. Silverstein is not requesting anyone to lift his three life sentences. Rather, having spent years studying Buddhism in prison, he wants to demonstrate at trial that he has changed. He also wants a shot at working his way out of solitary and some day dining and playing checkers with other prisoners and hugging his two children. For Rovner and the dozens of D.U. law clinic students who over the years have revolved on and off of his case, Silverstein is an amiable and grateful client who crochets hats, mittens, scarves and blankets for them and their relatives. When he has art supplies, he uses pastels and paint to make them artwork. That said, and despite his public apologies for his crimes, a three-time prison killer and former Aryan Brotherhood leader isn’t the most sympathetic figure in the growing national movement to end long-term solitary confinement. 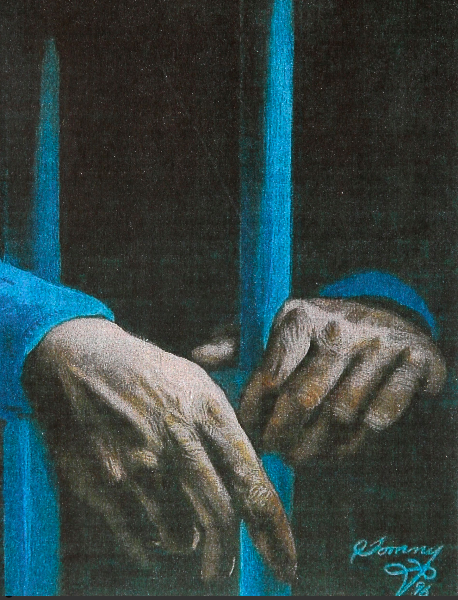 Silverstein’s case pivots not on redemption but on what, given all the research on the psychological harm of extreme isolation, is deemed to be cruel and unusual treatment of prisoners. In 2011, Juan Mendez, the United Nations special rapporteur on torture, issued a statement calling for an “absolute prohibition” of solitary confinement beyond fifteen days. He has asked, but not been allowed to tour ADX. The prison is the subject of a federal class action lawsuit about how it treats its mentally ill prisoners, some of whom starve themselves, self-mutilate to the point of cutting off their testicles or, as was the case with prisoner Robert Knott earlier this month, hang themselves with bed sheets. Mental health professionals, state legislatures and human rights organizations have condemned prolonged isolation, which is defined by the American Psychiatric Association as a period greater than three to four weeks. “Given that four weeks of solitary confinement was described as potentially harmful, the 30-year duration in this case compels scrutiny. If shorter periods of solitary confinement have resulted in psychological distress and symptoms, it is not unreasonable to assume that substantially longer durations provide a greater risk of serious health consequences,” several national groups and experts wrote the court on Silverstein’s behalf. A division of the U.S. Justice Department, under the federal Civil Rights of Institutionalized Persons Act (CRIPA), has investigated and found violations of state prisons for the overuse of solitary confinement. Perhaps the greatest irony about Silverstein’s case is that solitary confinement as practiced by the Bureau of Prisons, also an arm of the Justice Department, is exempt from that civil rights division’s review.